One of our staffers made a mistake on social media Monday involving the Council on American-Islamic Relations (CAIR). When CAIR pointed it out, he acknowledged the error and deleted the inaccurate post. But that wasn't good enough. CAIR likened his position working for IPT Executive Director Steven Emerson to being "'Chief Googler' for David Duke." The episode is telling, and not in any manner CAIR thinks it is. For starters, it shows how CAIR is quick to point out other people's mistakes but never acknowledges its own failings. And it shows that CAIR officials lack any sense of irony or self-awareness. 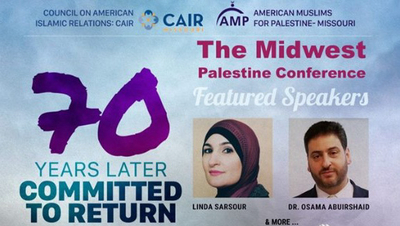 CAIR likened Emerson to the former Ku Klux Klan leader and renowned hater 24 hours after its Missouri chapter co-sponsored a conference with a group called American Muslims for Palestine (AMP), a group which supports Hamas and doesn't simply oppose Israeli policies, but tries to undermine Israel's entire legitimacy. The gathering featured a speech by Linda Sarsour. Just a week earlier, the Investigative Project on Terrorism exposed Sarsour's anti-Semitic tirade in which she blamed Jews for police shootings of unarmed black people in the United States. The Anti-Defamation League (ADL), she said, "takes police officers from America, funds their trips, takes them to Israel so they can be trained by the Israeli police and military, and then they come back here and do what? Stop and frisk, killing unarmed black people across the country." Sarsour rejects sovereignty for the Jewish people, rejects political support from Zionists and pushes a conspiracy theory that can only foster hatred toward Jews. That sounds an awful lot like David Duke. Yet, she still is welcomed and honored at CAIR events, including fundraisers. She's not the only one. CAIR hosts its national fundraising banquet Oct. 20 outside Washington, D.C. Speakers include Yasir Qadhi, a religious leader who advocates for Saudi Arabian-styled restrictions on Muslim women's lives and has spoken against capitalism and democracy, and Hatem Bazian, a leader of the BDS campaign that aims to isolate Israel economically and politically. CAIR Executive Director Nihad Awad, meanwhile, embraces Turkey's authoritarian Islamist President Recep Tayyip Erdogan, who has jailed thousands of journalists and dissidents and allowed Turkey to be a base for exiled Hamas leaders. Other Muslims have taken CAIR to task for blindly supporting Erdogan. But Erdogan's support for Hamas is relevant to CAIR's reaction to our staffer's Twitter error. It started when Zuhdi Jasser, founder and president of the American Islamic Forum for Democracy (AIFD) reposted an irreverent comic strip called "Jesus and Mo" as part of "Blasphemy Day." The comic casts Jesus and Mohamed in an "Odd Couple" sort of roommate arrangement in a series that mocks religion. 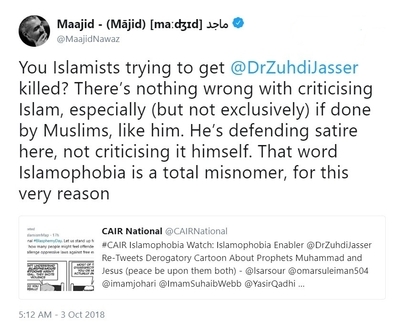 CAIR's national Twitter account used Jasser's post to smear him – a Muslim who advocates for reform of his faith – as an "Islamophobia enabler" and later claimed that reposting a Jesus and Mo comic shows that Jasser and AIFD don't "have the same respect for our beloved Prophets." Maajid Nawaz, a former radical and a fellow advocate for reform within Islam, suggested Wednesday morning that CAIR's rhetoric could lead radical Muslims to target Jasser. "There's nothing wrong with criticising Islam," Nawaz wrote, "especially (but not exclusively) if done by Muslims, like him. He's defending satire here, not criticising it himself. That word Islamophobia is a total misnomer, for this very reason." CAIR, meanwhile, grew reticent when the AIFD challenged it to condemn Hamas or acknowledge that Hamas is a terrorist organization. 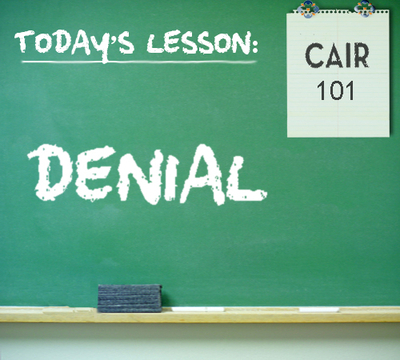 It's a question that CAIR officials have ducked as far back as 2001. Sometimes they try to talk around the question. Other times, they try to use indignation to steamroll the questioner. Bullying is easy. Acknowledging skeletons in its own closet is a bit more difficult. And CAIR has plenty of skeletons. It has never directly addressed its roots in a Muslim Brotherhood network in the United States called the "Palestine Committee." Evidence seized by the FBI show that the committee was charged with helping Hamas politically and financially. And a meeting agenda dated within weeks of CAIR's 1994 formation places it under the committee's umbrella. Awad, the only executive director CAIR has ever had, was listed in a Palestine Committee telephone list. The evidence was so substantial it prompted the FBI to prohibit agents from working with CAIR outside of formal investigations in 2008, "until we can resolve whether there continues to be a connection between CAIR or its executives and HAMAS." That policy remains in effect a decade later, so the questions either have not been resolved or have answers CAIR doesn't want you to consider. CAIR has faced few other consequences for its history, for the radical and often bigoted messages spewed by its officials throughout the country. Reporters rarely ask about them and give CAIR kid-glove treatment. Despite that, CAIR's first reaction is to go for the smear. Oppose Islamism and repost a provocative cartoon? You're an Islamophobe! Make an incorrect assertion, which is acknowledged and corrected? Invoke David Duke. And in those rare cases in which you are asked about your record? Deflect and attack. It does tell people a lot about CAIR.